Mary Maddox and Ted Thomas will host this month’s “Last Friday, First Call” neighborhood happy hour on March 31 at 1611 Hollywood Avenue. All Hampton Hills residents are invited to mix and mingle with their neighbors, and to bring snacks and libations to share. The fun begins at 6:30 p.m. This entry was posted in Neighborhood on March 25, 2017 by jongarinn. Among the early residents of Hampton Hills was Virgil Oliver Stamps, a gospel singer and promoter who helped make gospel music popular and widely available throughout East Texas and the southern U.S. He is perhaps best known for composing the music to When the Saints Go Marching In. After attending several music schools, he went to work with James D. Vaughan and ran the Vaughan Publishing Company office in Jacksonville, Texas, from 1915 into the 1920s. In 1924, Stamps opened the V.O. Stamps School of Music in Jacksonville. His friend J.R. Baxter became his business partner and they changed the name of the company to the Stamps-Baxter Music Company in 1927. The company quickly became the nation’s premier gospel music business. Its activities included songwriting, publishing and sponsoring musical groups and radio broadcasts. Baxter oversaw the operations east of the Mississippi River, while Stamps ran the operations in the western U.S. from his Dallas headquarters. This early success enabled Stamps and his wife, Addie, to purchase a new home at 1611 Hollywood Ave., where they lived with their teenage son, Ware. Stamps-Baxter helped bring gospel music into the mainstream by broadcasting it nationally on radio and by encouraging performance in public. Stamps and his quartet started a noonday radio program on KRLD radio in Dallas in 1936. The program brought him, the company and gospel music increasingly into public view. The radio program was so successful that it enabled Stamps-Baxter to become the most successful publisher of shape-note music in America. The company’s annual Stamps-Baxter School of Music stood as the largest developer of gospel singers in Texas and throughout the south well into the 1950s. Stamps died of heart disease on Aug. 19, 1940. His funeral was attended by thousands. In 1973, he was inducted into the Gospel Music Association Hall of Fame. The Southern Gospel Music Hall of Fame inducted Stamps in 1997. He has also been honored in the Texas Gospel Music Hall of Fame as a pioneer of gospel music. Today, Stamps’ former home at 1611 Hollywood Avenue is owned and lovingly cared for by Mary Maddox and Ted Thomas. This entry was posted in General on February 26, 2017 by jongarinn. Compared to others in the neighborhood, Bonnie is a new resident. She and her husband, Tom, moved to to Hampton Hills in October 2015. They have been married 41 years and have an adult son and daughter. Their first home, in Kidd Springs, was a Craftsman that they lovingly restored. They are excited to be working on their current home, in this beautiful neighborhood of classic Tudor architecture. Bonnie, a graduate of the University of Texas, is a lifelong learner, but also the mother of two Aggies. She spent her childhood in Oak Cliff considers herself a Texan through and through. She enjoys traveling and reading, as well as new adventures, and is looking forward to becoming the HHNA’s new president. Anthony and his husband, Lewis, moved into the neighborhood last year after falling in love with their Hollywood Avenue bungalow. They enjoy the quietness of the neighborhood and the unique character of each home. Anthony is currently a middle school counselor and previously worked in education at the community college and university levels. They have two cats: Benny, a Blue Russian/Siamese mix, and Nicky, an orange Tabby. They also enjoy watching movies, musicals, and traveling. John has worked in the construction accounting industry for more than 25 years, and his partner, Rod, has been with AT&T for more than 20 years. John first moved to Hampton Hills in October 2003. A few years later, his job took him to San Francisco, though he kept his house as a rental property. During this time, he reconnected with Rod, who he originally met when John was just 15 and still living in Dallas. As the relationship grew and his obligations in San Francisco came to an end,he knew he wanted to be back in Texas. So in 2011, John returned, and he and Rod moved back to Hampton Hills to make a home. They both love the charm/architecture of the neighborhood and feel blessed to be living around so many wonderful neighbors, many of whom have become very good friends. They consider themselves a pretty “laid back” couple: John enjoys gardening and is a bit of a “techie,” and they’re both committed to seeing this neighborhood realize its full potential! Voting commences on February 27th to formally elect this slate of nominees into office. 1.) An in-person vote will take place at 1415 Hollywood at 7 p.m. This entry was posted in General on February 15, 2017 by jongarinn. Visitors to Dallas often make their way to Dealey Plaza, the site of President John F. Kennedy’s assassination. They spend hours inside the Sixth Floor Museum, carefully inspecting the vantage point from the “sniper’s lair,” before moving outside to stand atop the grassy knoll, peer over the picket fence, and contemplate the place on Elm Street where an X marks the spot of our national horror. They travel to Oak Cliff to see the rooming house on North Beckley Avenue, where Lee Harvey Oswald lived in 1963, and to West Jefferson Boulevard, site of the Texas Theater, where he was apprehended by Dallas Police for the killing of officer J.D. Tippit on 10th Street. The simple, concrete memorial is intended to be a place of contemplation. Its 30-foot-high walls, open in the center and along most of the base, create a space apart from the bustling city. At the center is a black granite slab, too square to be confused with a tomb, inscribed simply with the President’s name. All these places and names, familiar to many Americans of a certain generation, create an impression of Dallas as a place of enormous sadness. Today, the School Book Depository is framed by a gleaming skyline like a monument to madness. Parkland Hospital’s former Trauma Room 1, where President Kennedy was examined and declared dead, still exists, although it is now abandoned and unrecognizable. The Parkland name now adorns a massive new building that looks more like a tombstone than a modern medical center. To live and work in Dallas is an almost constant encounter with its ghosts. Every day, motorists unknowingly pass the grave of Clyde Barrow, a poor hillbilly from West Dallas who met his own violent end in an ambush that also claimed the life of his lover, Bonnie Parker. Their bank-robbing shooting spree made them cult celebrities of the early 1930s. One can only imagine how they would have trended on today’s social media, given their fascination with collecting newspaper clippings of themselves and their exploits. To live in Dallas, you have to make room for its ghosts. Traveling its streets, passing its past, you may be able to avoid reality but you can’t escape it. Despite the popular appeal of J.R. Ewing and America’s Team, the Dallas Housewives and The Bachelor, Mark Cuban and Ross Perot, Dallas cannot erase its association with tension, trouble and terror. The city’s racist establishment, corrupt political system and north-south bipolar disorder have all been well documented. So why live in a place so fragmented, so divided, so haunted by past iniquities and enduring inequities? Although historically predominately white, Dallas has diversified as it has grown. Today, about a third of the city’s 1.3 million citizens are white, 25 percent are black or African-American, and nearly 25 percent are foreign born. The largest minority groups in the city are Hispanics and Latinos, making Dallas a microcosm of the U.S. population. To live in Dallas, then, is to live in America. Throughout this vast and conflicted city, you’ll find localized populations of Chinese, Korean, Persian, Indian, Bangladeshi, Pakistani, German, Arab, Polish, Russian, Romanian, and Jewish peoples. Our neighborhood, in south Oak Cliff, is almost equally divided between black and Hispanic residents. This multicultural mix is the direct result of what Dallas has come to represent: It is a place of new beginnings; of continuous change; of limitless possibilities; of big ambitions. The opportunity to make a fresh start continues to bring many people to Dallas. We will not be defined by our bloody, racist past but by our multiracial future. Our commitment to healing our wounds and working toward greater understanding and appreciation of each other will be the way we build a more perfect union. This entry was posted in City, General, Neighborhood on February 4, 2017 by jongarinn. If you’ve walked through Hampton Hills, you’ve likely seen a stamp such as this at various places in the sidewalk. 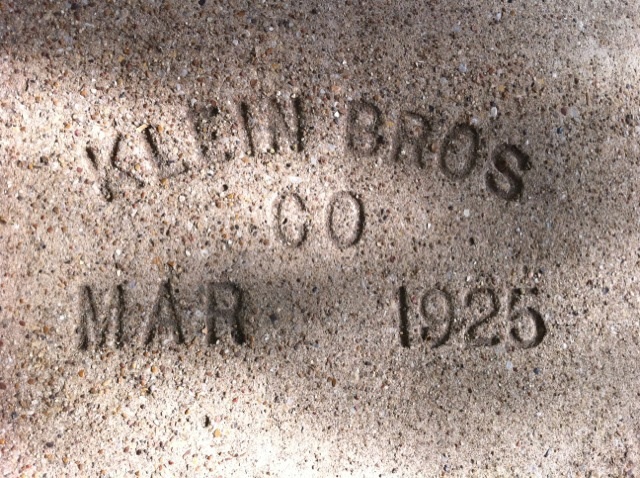 As the neighborhood developed and new walkways were poured, Klein Bros. changed out the date, providing a history of the neighborhood right under our feet. The first walkways were laid in 1925. Surprisingly the company is still in business, although the name has evolved to reflect the family’s development. Apparently, Klein Brothers did a pretty good job of mixing and pouring Hampton Hills’ walkways. The average lifespan of a concrete sidewalk is about 40 years, but some sections of sidewalk in Hampton Hills are now nearing 80! We have problems with tree roots pushing up entire slabs, but the concrete’s integrity remains. This entry was posted in General, Neighborhood on January 26, 2013 by jongarinn.